Your personal library of images is displayed below in alphabetical order by filename. You can upload additional images by clicking on the “Upload Image” button. A dialog box will open that will allow you to browse your own hard drive for the image you want to upload. The Control Panel supports the most common image formats .jpg, .gif, and .png. 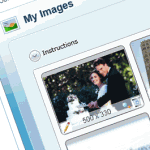 All of the images displayed on your dental practice website are stored in the “My Images” area, where they’re organized alphabetically by file name. You’ll want to upload some of your own custom images from your computer to your “My Images” section: doctor photos, logo, pictures of your facility – even a smile gallery or family photos – it’s up to you. Click “Upload image” to add a new picture to your image library. Click “Browse” to find the image you want on your computer; we accept jpeg, gif or png formats. Then click “Add Image to Library,” and it will appear in your library of images. Remember, any image you want to show on your site must be uploaded here first. Getting a picture to show up on your website is a two-step process. First, you upload the image to the “My Images” section of the control panel. Next, you choose where you want the image to appear; you’ll make those selections in other sections of the Control Panel. You can select particular images in the “Customize Portals” area. If the image is associated with a particular facility location, you can select it in the “Practice Locations” section. If the image is associated with a particular doctor, like a photo, you can link it to the doctor in the “Doctors” section. Below each image, you’ll see two numbers that indicate how many pixels wide and tall the image is. It’s very important to be aware of the size of your images, because your website will look best if you’ve sized your images correctly. For instance, when uploading a doctor photo, you will be instructed to select an image that is 120 pixels wide by 150 pixels tall. Most image or photo editing software lets you easily crop and resize images, or IDA can assist you. It’s pretty hard to make an IDA website look bad, but it’s important to use the right size images to make your website look as good as possible. You probably have a photo or image editing program on your computer. You can do it online at http://www.Aviary.com – a free online image editor. To resize: Select “Image” then “Image Resize.” Enter the new height or width and be sure to leave the box “Constrain proportion” checked so that the photo keeps its normal dimensions. Hit “Apply.” We only recommend using the resizing tool for decreasing size, not increasing.